While covering the Iraq war, BBC producer Stuart Hughes lost his leg. His new prosthetic foot is so advanced, it may even allow amputee soldiers back into battle. Every evening, before I switch off the bedside light, I take my right leg off and plug it into the mains. I am a below-knee amputee. I lost my leg in 2003 after stepping on a landmine while covering the war in Iraq for BBC News. A few weeks ago, I became one of the first people in the UK to be fitted with the world's first "intelligent" prosthetic foot. The word "bionic" inevitably conjures up memories of the 1970s TV series, the Six Million Dollar Man. Unfortunately, my prosthesis doesn't enable me to leap over a wall with a single bound or run faster than a speeding bullet. Rather, it uses sensors and a built-in microprocessor to mimic some of the actions of a human foot. The Proprio Foot is one of a new range of bionic artificial limbs designed by Ossur, a prosthetics company based in Iceland. "The sensors detect whether the user is walking on level ground, going uphill or downhill or climbing steps," says Ossur's Richard Hirons. "Every type of terrain has a distinct 'signature' which the software controlling the foot is able to interpret. When the microprocessor recognises a change in terrain, it instructs a very accurate motor to automatically adjust the angle of the foot in preparation for the next step." Researchers have been connecting man and machine since the 60s when they first began using electrodes attached to the body to direct motorised arms to move and bend. But Saeed Zahedi, visiting Professor in Prosthetics at the University of Surrey, says more and more computer-controlled devices are beginning to emerge from the laboratory and on to the marketplace. "The technology is a lot cheaper now," Professor Zahedi says. "Electronic components that would have cost hundreds of pounds 10 years ago now cost just a few pounds. "Computer-controlled devices can be programmed and are much more flexible, which is why designers are choosing them instead of complicated and expensive mechanical devices." One market keeping a close eye on developments is the military, which has seen a rise in the number of amputees among its ranks. Advances in battlefield medicine and better protective equipment mean that many soldiers who would once have died are now surviving, but are returning from war zones with horrific injuries. Hundreds of soldiers serving in Iraq and Afghanistan have lost limbs, many due to roadside bombs and improvised explosive devices. Once, a soldier who had lost a limb in battle would have been pensioned off or transferred to a desk job. Now, though, some are being passed as fit for duty and are being allowed to return to the frontline. "The mindset, even as early as five years ago, was if a soldier had impairments such as an amputation, they are unfit and they may be at risk to others around them if put in a combat situation. That has changed," says Colonel Daniel Garvey, Deputy Commander of the US Army Physical Disability Agency. "If a soldier wants to remain on active duty, we are going to find a job for him. That is a cultural change for us." But Grania Hyde-Smith, from the Limbless Association, a charity which provides advice and support to amputees, urges caution. She says the cost of the current generation of bionic limbs - up to £60,000 for some powered knee systems - puts them beyond the reach of many users. Ms Hyde-Smith wants more research to be carried out into whether the benefits justify the hefty price tag. "Bionic technology definitely offers new prospects that weren't available before, but I don't think we should get carried away just yet," she says. "People are reading about the new technology and are getting very excited about it -- and rightly so. "But if you speak to health care professionals and prosthetists they say it's still very early days. They're not sure the new systems have been tried and tested sufficiently." Some researchers believe the current generation of bionic limbs is just the beginning. They are working towards the day when man and machine are seamlessly integrated. "There's bound to come a time where the concept of the bionic man stops being just science fiction," says Professor Zahedi. "Promising work is taking place with limb transplants. One day it may be possible to create hybrid limbs which combine human tissue with electromechanical devices. Experiments with neural implants are also progressing quite rapidly, connecting the nervous system to external devices. What we're seeing at the moment is just the tip of the iceberg." Perhaps one day an electronically-enhanced human being - "better, stronger, faster" as the opening titles of the Six Million Dollar Man put it - will be a reality. But bionic technology is already bringing benefits for amputees like me - just so long as we don't forget to recharge our batteries. I disagree with Grania Hyde-Smith, from the Limbless Association. I've been an above-knee amputee for five years now. I have a C Leg, by Ottobock. It contains a microprocessor as described in the article. The difference in my quality of life from using this leg versus a traditional mechanical leg is worth way more than 60K pounds. The amount of energy I use to walk is greatly reduced. I fall less often than I would, since the knee detects stumbles and changes in walking speed and adjusts for them. This all means I can work fulltime, care for my two year old son, and have as independent a life as possible. I retired from the US Army after 30 years of serving our great country. During my duty at Fort Stewart, I visited our soldiers at Walter Reed Medical Center, MD, every month. I strongly agree with Col Garvey - keep amputee soldiers in our army. This was my number one request when I visited our soldiers. Wounded in action soldiers want to serve. There is one very famous military amputee that went back to the front line 60 years ago - Group Captain Douglas Bader. Injured in a crash in the 20s, fought everyone to get back in to the air force, there was no reason why he shouldn't have been he could fly better than anyone else. It was just not accepted by anyone, but Douglas fought all the way and one, he was one of the reasons why we won the Battle of Britain. For 25 years I've had a lower leg that, while still there, has been seriously compromised (war injury). This is the first thing I've seen that makes me feel that it might be better if my leg did drop off one day. Bravo bionic technology, I have always long to see the end to the sufferings of the limbless. Disability is not inability and so incorporating them back in to society bridges the gap. The cost is the only drawback, I hope it will be cheap and affordable one day. 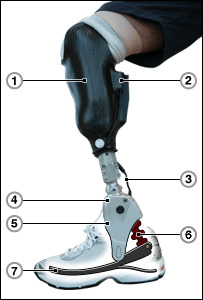 I can't wait to get a bionic foot so that I can go walking on all sorts of terrain not just flat surfaces. It will make amputees much fitter because as you get older it is more difficult to take exercise which involves walking or running. Might the day come when prosthetic limbs are better than their organic equivalent? - then everyone might want upgraded body parts. In time I'm sure we could come up with some 'alternative' designs that improve on the original and allow movement not currently envisaged. Exciting stuff! I remember reading concepts about heel-powered systems to provide electrical energy through walking; the focus market was laptop users. Could lower body limbs use the compression of impact whilst walking to recharge their power levels. If it worked, then the limb could even use a smaller battery.